When the Album Of The Year award gets broadcast on Sunday's edition of The Grammys, two hip-hop albums and two R&B albums will be in line to win. There have been 3 other occasions in which 2 hip-hop albums have been nominated: 2003 (The Eminem Show, Nellyville), 2004 (Speakerboxx/The Love Below, Under Construction), and 2014 (good kid, m.A.A.d. city, The Heist). Only two hip-hop albums have ever won the award: Speakerboxx/The Love Below by Outkast, and The Miseducation of Lauryn Hill by Lauryn Hill. If you're wondering why so many rappers have boycotted and called the award show out in the past, part of the answer is in the figures. 1986 was the year that hip-hop arrived on the mainstream radar, with Licensed To Ill by The Beastie Boys, which is certified Diamond for 10 million copies sold. In 1988, Public Enemy released It Takes A Nation Of Millions To Hold Us Back, an album that sold 500,000 copies in its first month on sale, and was given a perfect score by at least 10 major review outlets. 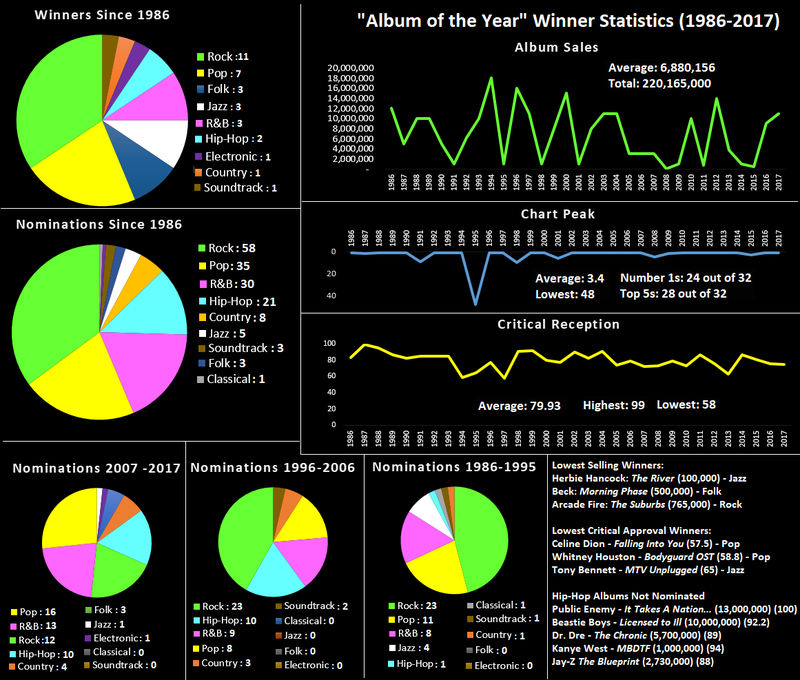 Its statistics rival any album released that year, yet it wasn't even nominated. Rock has dominated the winners list since 1986. Surprisingly, jazz and folk have both out-performed hip-hop, and although R&B also won more often than hip-hop, considering how many nominated it's received, 3 wins is quite low. Folk has been nominated 3 times, and won 3 (Raising Sand, Babel, Morning Phase). Electronic also holds a 100% nomination-to-win ration, thanks to Daft Punk's Random Access Memories in 2014. At the other end of the scale, classical had one nomination and no wins, while hip-hop and R&B both sit on 11%; 11% of the time they are nominated, they win. These figures aren't a perfect display of bias or win ratio, since genres can be nominated multiple times for just one award, and there are a finite amount of genres. 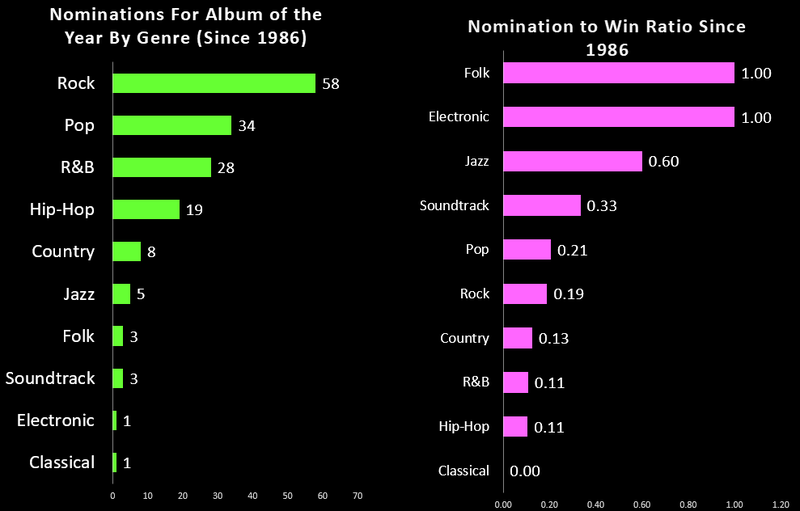 For example, in 1990, every nomination was for a rock album, meaning the nomination-to-win ratio was 0.25. 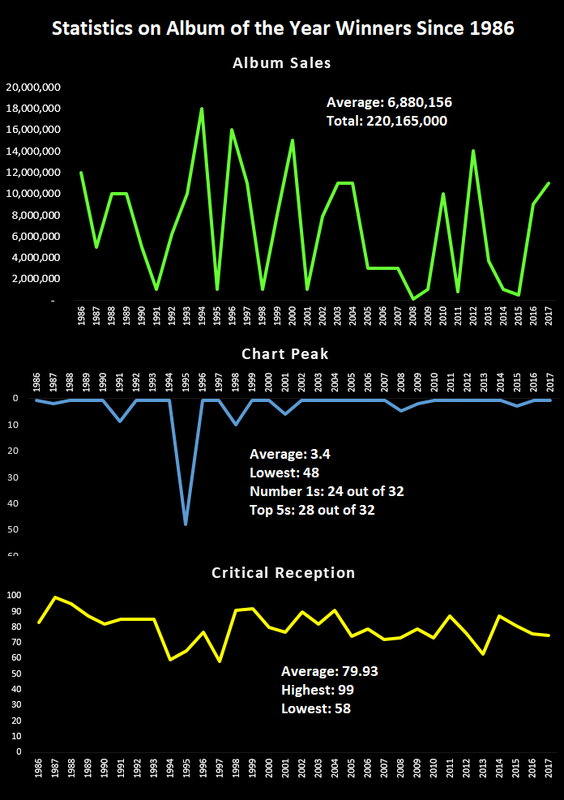 It's inaccurate to say rock had a worse year in 1990 than electronic did in 2014 (when it was nominated once, and won once), but the analysis still gives a good indication of the popularity of each genre when it comes to total nominations and total wins. This graph shows an interesting trend. 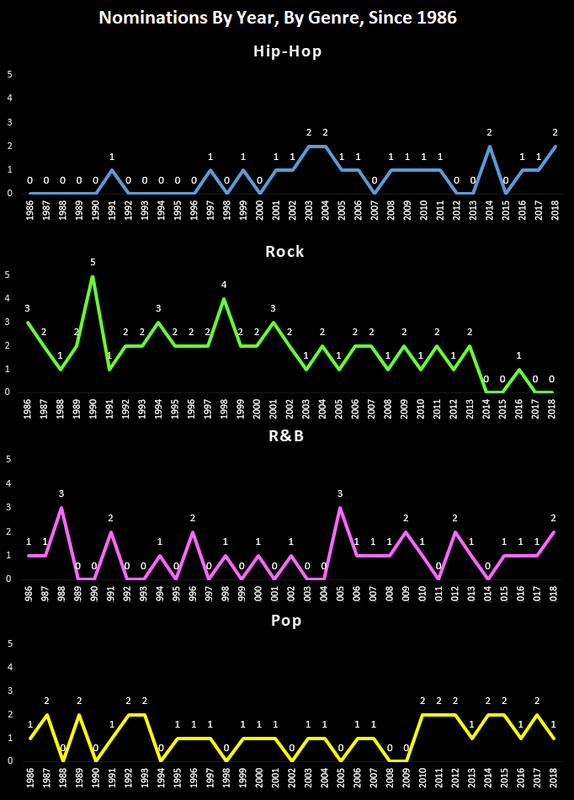 Rock was dominant all the way until the mid-2000s, and it began to taper off. 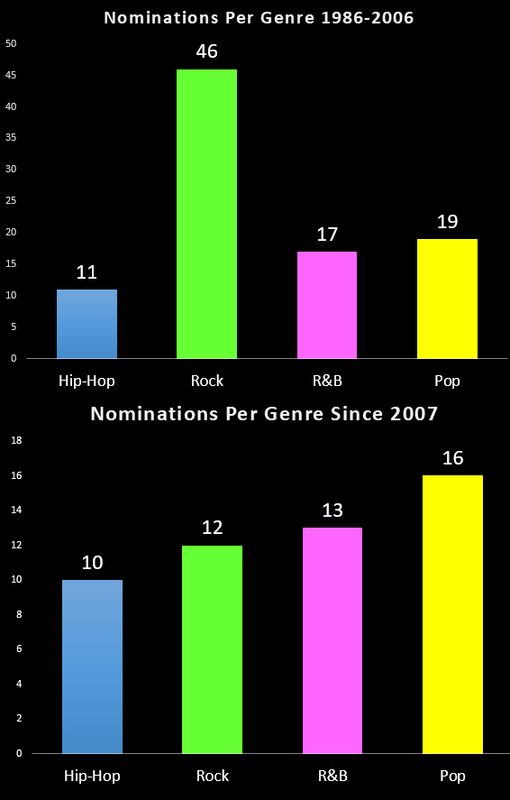 Since the early 2000s, all 4 major genres have been represented more evenly in nominations. This change doesn't specifically align with any major changes in measurable consumption of each genre. Hip-hop became the most popular genre in North America in 2017, but in July of 2017, a report was published stating hip-hop had only just overtaken rock as the most consumed genre in the US, meaning right up until 2017, rock was still being consumed more than any other genre. And hip-hop has been popular, relevant and critically acclaimed since the late 80s. So why exactly has it been nominated less, and why does it win less, than rock and pop? Any idea that the most popular or successful album of the year isn't a major chance of winning the award is debunked by this graph. The prior award winners have been ultra successful and almost all very well received by critics. Only 3 Album Of The Year winners (out of 32) are currently certified less than platinum: Herbie Hancock's The River, The Suburbs by Arcade Fire, and Morning Phase by Beck. All of those albums were released post-2000, so it's likely they will achieve platinum status at some point in the future. 13 of the 32 winners have been certified Diamond for 10 million sales in North America. While the sales boost that accompanies winning the award can't be discounted in these statistics, it's unlikely that an Album of the Year victory would lead to 10 million extra sales. And 6 of the 13 Diamond albums were released since 2000, 3 of them this decade, including Adele's 25 in 2017. With the above statistics, it becomes even more perplexing that more hip-hop albums haven't been nominated, let alone won the award. There are more than 10 hip-hop albums that have sold above 9 million copies in the U.S., and only 4 of those have been nominated, with only 2 winning (Lauryn Hill and Outkast). Missing entirely from the nominations list are Notorious B.I.G., 2Pac, DMX, Ja Rule, and 50 Cent. And despite the upturn in rap fortunes since 2007, the award hasn't been won by a rap album since 2004. There have been notable albums since 2000 that haven't even recieved a nomination, including The Blueprint by Jay-Z (88 on Metacritic), and My Beautiful Dark Twisted Fantasy by Kanye West (94 on Metacritic). Both these records sold over 1 million copies. There have been plenty of albums from other genres that have a score above 90 on Metacritic from the last 10 years, but very few of them meet the commercial success requirements that seem to be essential in winning Album of the Year. Artists like Leonard Cohen and Ry Cooder released critically acclaimed albums since 2009, but they didn't sell well at all in North America. And there have been rap albums nominated in the past that meet both the financial and critical requirements to win the award, yet were overlooked. Eminem's The Marshall Mathers LP is certified Diamond and picked up an 86.3 approval rating from critics, yet it lost to Steely Dan's Two Against Nature, a record that is only certified platinum, with a 77 approval rating from critics. Kanye's The College Dropout lost to Ray Charles' Genius Loves Company. Their sales are similar, yet Kanye has an approval rating 13 points higher than Ray Charles. Kanye has been consistently snubbed. In 2006 he was beaten by U2's How To Dismantle An Atomic Bomb, which sits 6 points lower on Metacritic with similar sales. Then Kanye somehow lost in 2008, when Graduation was beaten by Herbie Hancock's River: The Joni Letters. Hancock's album sold 100,000 copies, with an approval rating of 73. Kanye's Graduation sold 2 million copies, with an approval rating of 79. Will Hip-Hop Win In 2018? Both DAMN. by Kendrick Lamar and 4:44 by Jay-Z meet the sales and critical approval requirements to win the award, but they're up against a hugely successful and popular album in 24K Magic by Bruno Mars. Statistics say Bruno will win the award, and the least likely is Lorde. Very occasionally the Album of the Year award strays from the "Sales and Critical Approval" popularity contest, but the only time it does that, it awards an album that isn't from R&B or hip-hop.